Eternal Orthodox Church calendar for the 18.12 year 2017. The unknown village of Mutalaska, in the province of Cappadocia, became famous through this great light of the Orthodox Church, for St Sava was born there. He left the home of his parents, John and Sophia, at the age of eight and became a monk in a nearby monastery called `Flavian's'. After ten years, he moved to the monasteries of Palestine, staying longest in the monastery of St Euthymius the Great (Jan. 20th) and Theoctistus. Euthymius, who had the gift of discernment, foretold that he would be a famous monk and leader of monks, and that he would found a monastery that would be greater than any other of that day. 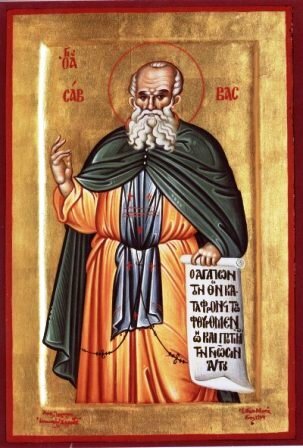 After St Euthymius's death, Sava went into the desert, where he lived for five years as a hermit in a cave which an angel of God showed him. After that, when he had become a perfected monk, he began by divine providence to gather round him many desirous of the spiritual life. They very quickly grew in number, so that Sava had to build both a church and many cells. Some Armenians also came to him, and he set aside a cave for them, and they celebrated the services there in their own language. When his father died, his aged mother Sophia came to him and he made her a nun and gave her a cell away from the monastery, where she lived in asceticism till her death. This holy father endured many attacks from those close to him, from heretics and from demons. But he overcame them all in these ways: those close to him he won over by his goodness and forbearance, the heretics by an unshakeable confession of the Orthodox faith, and the demons with the sign of the Cross and the invocation of God's aid. He had a particularly severe battle with the demons on the mountain of Castellium, where he founded the second of his seven monasteries. He and his neighbour, Theodosius the Great, are considerd to be the greatest lights and pillars of Orthodoxy in the East. Kings and Patriarchs were brought to the right Faith by them, and these holy and wonderful men, strong in the power of God, served each and every man as an example of humility. 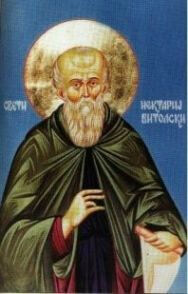 St Sava entered into rest in 532 at the age of ninety-four, after a life of great labour and great reward. Among all his other great and good works, let this be remembered above all: that he compiled the first Order of Services for use in monasteries, now known as the Jerusalem Typikon.